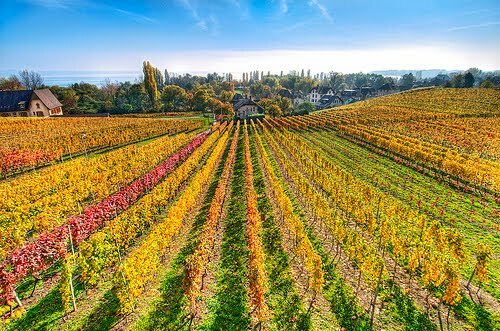 California currently produces about 90 percent of the wine in the United States, followed by Washington, Oregon and New York. It wasn't always the case. Until around 1890 Ohio was the leading producer of wine in the U.S. and 80 of Ohio's counties reported growing grapes as a crop. In fact, in 1890 in Erie County alone, 2.5 million gallons of wine were produced -- that's three times the production of Ohio's modern wineries! No offense to Thomas Jefferson, but the first successful commercial winemaker in the U.S. was Nicholas Longworth of Cincinnati who produced a sweet sparkling wine with the local Catawba grapes around 1830. So, wine in American wasn't always about Napa Valley. This is all ancient history, isn't it? Surely no one could wrest the wine crown from the Golden State -- or could they? W. Andrew Beckstoffer, the president of Beckstoffer Vineyards and the most highly regarded independent wine-grape grower in Northern California, delivered the keynote address “A California Wine Story: Can it happen again in the East?” to a sellout crowd at the Wineries Unlimited Trade Show and Conference on March 10 at the Valley Forge Convention Center. More than 2,300 from the wine industry representing 30 states as well as Washington, D.C. and four Canadian provinces attended the conference. He provides background on how Robert Mondavi transformed the California wine industry and holds out hope that this accomplishment could be repeated elsewhere. He specifically references the East coast, but I would say that the Finger Lakes, Michigan, Ohio and Ontario have the terroir and grape production to make things interesting. Special thanks to Richard Leahy, East Coast editor of Vineyard & Winery Management Magazine for providing the following excerpts from the Beckstoffer address. "The California story is not unlike the story of a great vineyard. The total equals more than the sum of the parts. But an understanding of the parts can help attempts to repeat it. "It wasn’t until 1967 that dry table wine sold more volume in the U.S. than sweet wines. So, any modern California story can start there less than 50 years ago. In 1970 Gallo bought 50% of the grapes produced in the Napa Valley. In 1970 the price per ton for Cabernet Sauvignon in Napa Valley was less than the price for the Napa Gamay variety. "Then came Robert Mondavi and the Napa Valley and California wine business were never the same again. Bob said that wine was part of the good life, and our wines were as good as the Europeans’. He talked a lot and he traveled a lot. "Grape growing is a business and we organized for strength, analytical ability, leadership and a united front for a group of independent entrepreneur farmers. In 1975 we founded the Napa Valley Grapegrower Association to enhance the social, economic and political status of grapegrowers. Through this organization the grape farmers began to demand a seat at the table. The focus on vineyards and sustainability had its start! "A disaster hit the Napa Valley in 1989. The modern phylloxera infestation ruined 95% of Napa’s vineyards. That was turned into an expensive but major opportunity by the Napa vineyard owners. Combating phylloxera required new rootstock but the Napa vineyardists replaced not only the rootings but also the scion woods, the vineyard spacing, the trellis systems, yield expectations, and most vine manipulation and irrigation schemes. The replanting was complete by the mid 1990’s and a new age of grape and wine quality began around 2000. Napa Valley took on a new leadership role in the world of grape and wine quality. "Today the top wines are 'vineyard designates' with emphasis on the vineyard’s contribution to quality. California wines are agricultural products-- not products of some chemical manufacturing process. "For the finest wines prices began to rise and we tied the price of grapes to the final retail bottle price. Generally, in agriculture the grower wants to overproduce and the processor wants to underpay. Our scheme eliminated that. Everyone worked for maximum quality in the grapes and the wine and for effective marketing. This brought an increase in wine quality. "Before I leave this I would like to mention one item of concern to us all: the American appellation. Today federal labeling laws allow wines with an “American appellation” to contain up to 25% foreign wines. With the current global wine supply situation and cheap labor and government support overseas, it could become a major threat to the integrity and profitability of our business. The California Association of Winegrape Growers (CAWG) in conjunction with the New York Wine Grape Growers Association, and the Oregon and Washington associations of wine grape growers, have filed a petition with the TTB to eliminate this foreign component. I strongly urge you to become more knowledgeable about this situation and request your local organization to join us in this petition. "Is there anything in that story that could not happen here on the East Coast or that doesn’t provide opportunity in 2010? There are 70 million millennium American young people aged 16 to 33 arriving on the scene and they are experimenting with wine early. They have little respect for history and their parents’ tastes. They can be viewed as a threat to California and an opportunity for you. "Wines from the American East Coast could rival import sales in the U.S. and that would be wonderful for all of us. It’s up to you! California will likely always be the major player, but there is a larger spot for the Eastern U.S. wines if you want it. It’s a brand new world and East Coast wines have as much chance as anyone. I can hear a Pennsylvania-born Robert Mondavi saying just that today!"